April's crash near Smolensk killed Polish President Lech Kaczynski and 95 other top officials and dignitaries. 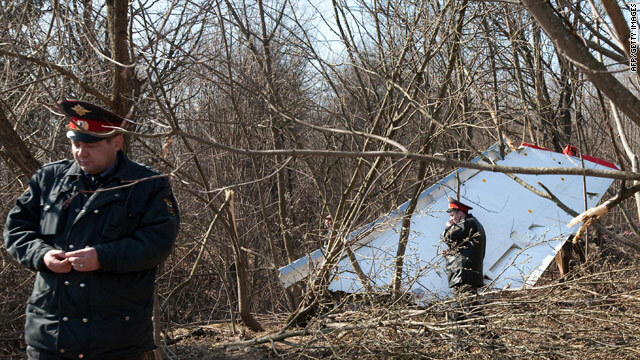 Moscow, Russia (CNN) -- A criminal case has been launched against four Russian soldiers on charges they illegally used credit cards belonging to a Polish official who died in the presidential plane crash in Russia in April, Russian authorities said Tuesday. "The criminal case has been started against four conscript soldiers on charges of theft by an organized group. The four were in the cordon at the scene of the crash," the Investigation Committee of the Russian Prosecutor's Office said. The soldiers took several cards but only used one of them to withdraw cash, stealing about 60,345 rubles (about $1,900) in several transactions, the committee said. The committee said the suspects were identified by the command of the military base that services the military airport near Smolensk, Russia, where the plane crashed April 10. "It was established in an inquiry that soldiers Sergei Syrov, Igor Pustovar, Artur Pankratov, and Yuri Sankov made use of these bank cards," the committee said. All four soldiers have confessed and are actively cooperating with the investigation, the committee said. The plane went down near Smolensk airport in western Russia, killing Polish President Lech Kaczynski and 95 other top Polish officials and dignitaries. They had been heading to Smolensk to mark the 70th anniversary of the massacre of Polish soldiers there during World War II. Russian and Polish aviation experts last month ruled out any emergency or equipment malfunction as the cause of the crash, but they did find there were people in the cockpit who were not members of the crew. There was also heavy fog in the area at the time. Russian State TV reported the soldiers admitted they spent the money at a local cafe. Three of the four suspects had a criminal record before they were conscripted into the army, the committee said. They are now being held at their military base "under the observation of their command." Russia's Interfax news agency, quoting the Polish newspaper Rzeczpospolita, said the misappropriated credit cards had been owned by Andrzej Przewoznik, who was secretary-general of the Council for the Protection of the Memory of Combat and Martyrdom. The Russian Defense Ministry issued a statement Tuesday saying it will reimburse Przewoznik's relatives for the stolen money as soon as the investigation is over.